They help pull a design scheme together. What makes a room stand out is the mixture of different textures, colours and patterns all working together as a whole to create interest. Pillows are a great contributing factor to that effect. In a design scheme in which a few colours are introduced what better way to tie it together or accent it with the use of pillows of each colour or patterns. Pairing or using uneven numbers there are different ways you can position your pillows on a sofa or a chair, you can pair them or use uneven numbers depending on your preference or amount of space you have. 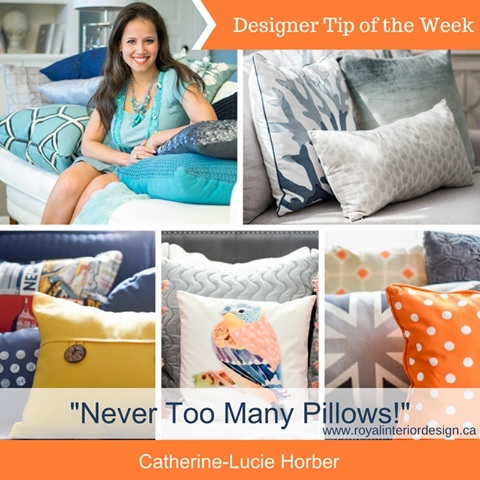 You can use a balanced or an asymmetrical approach - I find that my brain and creative eye seems to often gravitate towards a more symmetrical balanced design, but there are many other ways pillows can be placed. An unbalanced asymmetrical pillow usage in quantity or colour can also make an interesting, eclectic statement. Use of multiple sizes: you can also play with the different sizes of the pillows. They can be all the same size or slightly different or a gradation or even shapes etc.. I tend to like to start big then medium and small, the smaller sizes usually being a rectangle 12x24 if there is enough room to put 3 per side or I may use the rectangle in the middle. It depends if it is for a bed or a sofa. There are many ways pillows can be used. Embrace its many possibilities, but do not stay away from using them as they make a big difference into the decor. It is softer, warmer, more interesting and inviting!